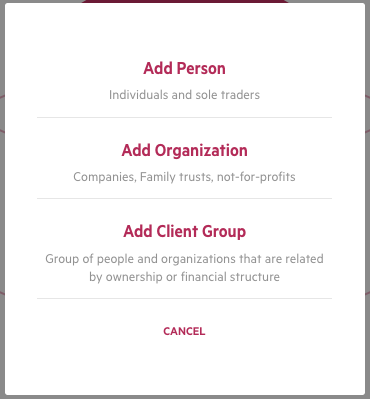 Use client groups to manage people and organizations that are related by ownership or financial structure. 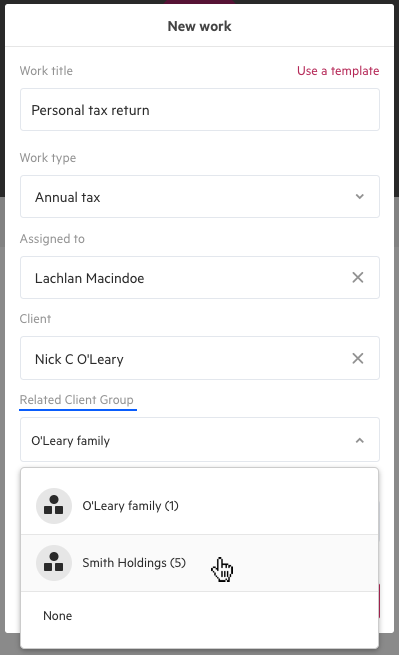 You can create a client group to manage related contacts, create work for them, and see all related jobs in a single view. This might be useful if you have people and organizations that are related by ownership or financial structure. When you choose to create a new contact, you have the option to create a new client group. 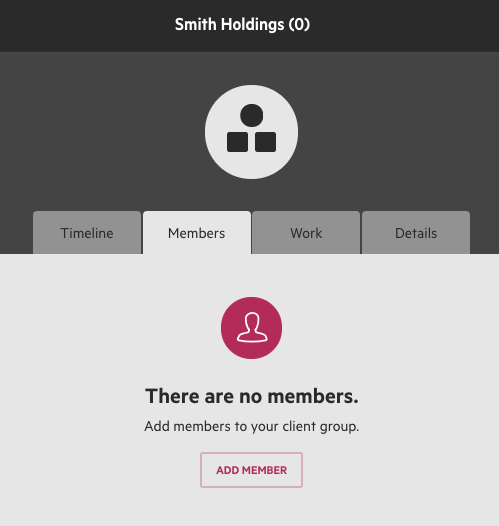 You will then be able to choose a name for you client group, and a contact type if you'd like. 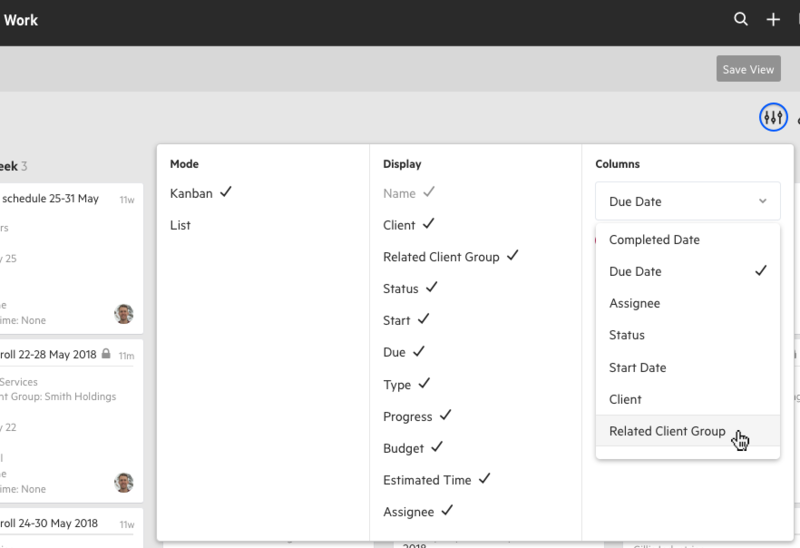 Timeline: The client group timeline will display any emails or notes that you or your team members choose to add. Items related to member contacts are not automatically displayed. Members: All contacts that are members of the client group are listed here. You can also choose to add new members from here. Work: Work items that have been created for the client group, or client group members, will be displayed here. Details: Information related to the client group is stored here, including basic contact details, a client identifier code, primary contact and client owner. You can also upload documents to the contact type on the details tab. Any person or organization contact can be added as a member of a client group that has been created. From the Members tab, choose Add Member. You will then be able to search for any existing contacts, and add them as members. Work related to a client group will include any work items that have been created with the client group as the client, or any work items for members of that client group. You can view these work items in a range of ways. The Work tab of the client group page lists all related work items on the work tab. You can sort your Kanban board so that work items are categorized into the client group they are related to. 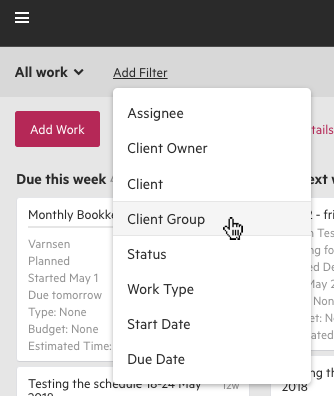 You can add a work filter to your work view and only view work items related to a chosen client group/s. When you filter to see work relating to a specific client, you will be able to sort your Kanban board by clients. This will sort your work items into a different column for each contact it is for. Because you are unable to reassign work to different clients, the drag & drop capabilities of your Kanban board are disabled for this view. When you are displaying your work in list mode, you will see a column for Related client group. Work for a person or organization can be added to a maximum of one client group. 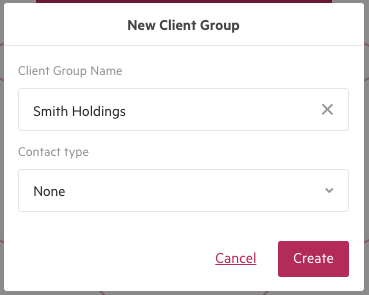 When you create work for a contact who is member of more than one client group, you will have the option to select what group you want the work added to.